Last night's episode of The Daily Show featured MIT Media Lab instructor David Rose talking all about connected objects and his new book, Enchanted Objects. 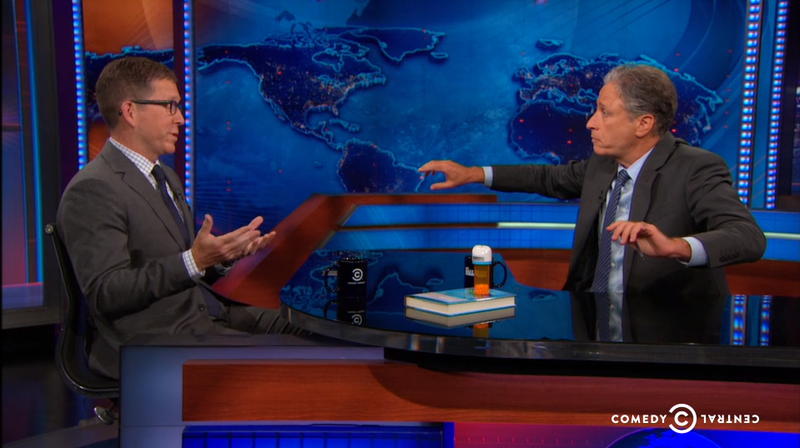 The hilarious interview left Jon Stewart in awe over the new frontier of tech. The brunt of the interview had Rose showing off one concept or another followed by Stewart reacting with a mix of wonder and bewilderment at the idea of everyday objects being enhanced by network technology. He was particularly tickled by Rose's tweeting scale. Yes, a tweeting scale. Stewart tried to imbue the conversation with some healthy skepticism about our lives being taken over by tech, but Rose was great at steering things toward the lighthearted by revealing more cool connected toys. Stewart definitely ended up looking like a bit of an old fogey, but hey, he's a beloved old fogey. To see the full extended interview, head over the The Daily Show website.